Escapade privée et unique au centre des Berkshires. Nous sommes à 3 minutes à pied du théâtre multiplexe Berkshire Mall ou du sentier ferroviaire Ashuwillticock. Situé sur 40 hectares boisés avec des sentiers pédestres et une passerelle spéciale en bois surélevée menant à une terrasse au centre du marais. Arbres extraordinaires et formes de terres et espaces privés à explorer. Le chalet est une construction récente. Espace super confortable au-dessus d'un garage autonome pour 3 voitures. Plan d'étage ouvert avec sièges de fenêtre amusants, cuisine complète et salon et salle de bain complète. We came up for a nostalgic trip to Jiminy peak and what a great location this spot was. 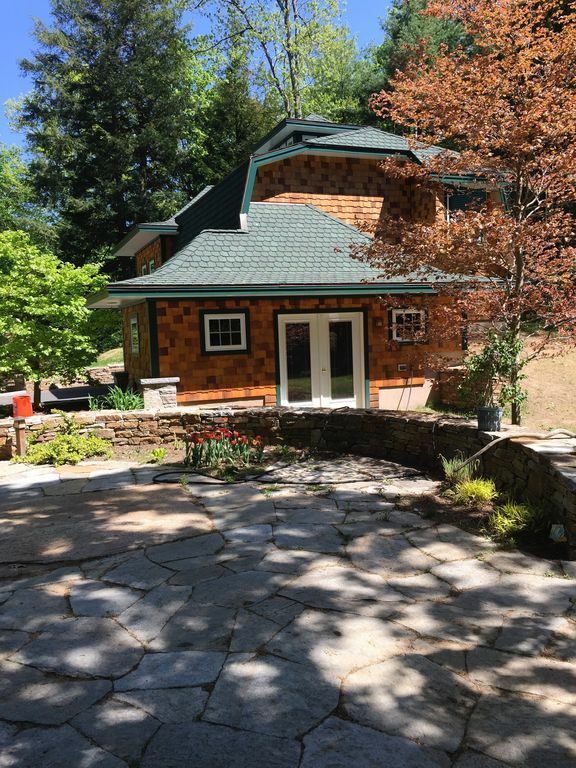 Tucked beside the main house, a good private distance away, the studio is about 15 minutes from the peak and 10 minutes from downtown Pittfield. Chris, the friendly host, has kept this little studio spotless, spacious, well decorated and completely decked out with one of the best surround sound systems we have experienced! We will definitely be coming back in warmer weather to explore the many trails on the grounds and surrounding lakes. The owner, Chris, was really accommodating! I was close to cancelling my reservation because of work circumstances and Chris was really nice and worked with us and or schedule! Luckily we didn’t have to cancel!!! So the cottage itself is PERFECT for a couple. It’s actually quite spacious and i was impressed how everything was set up! Quiet, peaceful, clean, and pretty. Christopher's place was quiet and private. This is exactly what we were looking for. The location is filled with nature. I truly loved sitting in the window seat reading, sipping tea, and admiring the outside. Chris is super easy to work with responds immediately to questions. The carriage house was a beautiful place to stay between twilight snowboarding and spending the day at Jiminy. We want to check it out again in the summer months to explore the trails, enjoy the outdoor features! Loved our stay. Chris was a great host; extremely courteous and caring. House was extremely clean, throughout. Full kitchen and great soundsystem. Very comfortable bed. Radiant heating worked super-well despite the very cold temps outside. Seclusion and large wooded acreage out back was a nice, extra feature. Will definitely stay here again. As a Christmas gift, I purchased my parents a day pass to the Kripalu Center for Yoga and booked two nights at this home. It was a perfect spot and my parents had a great time. Then enjoyed the trails on the property, nearby parks, as well as the proximity to Tanglewood, Kripalu, and shopping. They also said that Chris was very welcoming and helpful.